Our authentic femininity is the ‘original’ femininity we are born with. It lies in our female body, in our cells, in our bones, in our DNA, in our instinctual self and our deepest patterns of behaviour. It is who we are before the modern world takes over with all the restrictions and expectations of our upbringing and society. We can think of our femininity as being like an old masterpiece painting that has become dirty and darkened with time. We can see the rough shape of the painting underneath the layers of dirt, but we cannot see the beauty of the original colours or the intricacies and details of the true picture. For so many of us we are living a faint outline of our original femininity. The Womb Blessing cleans away the dirt and restrictions on our femininity. With each Blessing, the layers of dirt become thinner, and we begin to see the original colours shine through. Eventually the whole picture is clean, and we see the beauty of the original masterpiece – the vibrancy and fluidity of the artist’s colours and lines, the detail and subtleness and the contrast and emotion of the painting are revealed in all their glory. We feel that we have come home to the beauty and vibrancy of who we truly are. We feel whole and centred, empowered and free, worthy, creative, sexual and spiritual. And we are free to be everything – every colour and every shape of our original femininity. The painter of our masterpiece is the Sacred Feminine and, like every artist, She puts Her heart, Her soul, and Her energies into the painting – energies that are uniquely female because they express and reflect Her nature. These energies flow through our being and through our levels of awareness. They flow through our core patterns and through the principal female energy centres within our body. For many of us these energies are hidden beneath the dark layers of restriction, but sometimes we see their bright colours appear in our lives and they cause confusion and disruption because we can’t see the whole picture. 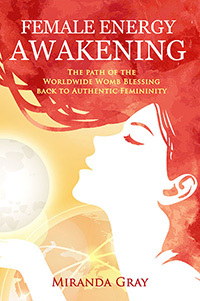 The Womb Blessings helps us to reconnect with these energies within us – to accept and love them as they gradually awaken in our lives, and to live in harmony with them so that we don’t return to the darkness. When modern life tries to bury our colours, the Womb Blessing clears away the dirt and returns our vibrancy to us. 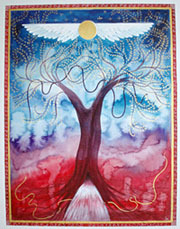 The first Worldwide Womb Blessing was offered on the full moon of February 2012, and it started, as many ideas do, with an open heart and a desire to help. The initial hope for reaching and helping fifty women grew throughout 2012 into a worldwide female spiritual movement reaching thousands of women around the globe. What started in 2012 has not stopped, but like a bud it has blossomed into something beautiful. Just as the moon flows from crescent to full, from full to crescent, and crescent to hidden; just as a bud opens to flower, then fruits; and just as the maiden matures, becomes a mother, a wise woman, and an elderly woman – our awakening has a cycle to it. The development of modern science and medicine has had an important role in shaping how we feel about our womb. The masculine approach of objectiveness and ‘fixing’ things has taken many women away from the subjective experiential awareness of their female energies and prevented the validation of these important experiences. The womb centre, the mind, and the heart are deeply linked, and to work with just the physical is to separate women from their full being and from the full perception of themselves and of life. The result of this isolation of the self is to live from an unconscious fear-based approach. By removing feelings of wholeness, creativity and empowerment from our lives, and by making natural aspects of ourselves unacceptable and a threat to our survival or status if we do not override them, society triggers our primitive brain response of ‘fight or flight’. Our lives then reflect these two responses with episodes where fear, anger and aggression drive us, or anxiety and a sense of vulnerability restrict us. Our primitive survival and stress responses overwhelm the beautiful changes and gifts that lie in the phases of our womb’s cycles and alienate us further from the supportive and life-affirming experiences they bring. We lose touch with the joy of a spiritual relationship with the world and the pleasure of unlocking and expressing our inspiration and creative power. Without understanding why we feel disconnected, feelings of frustration, inner turmoil and self-hatred arise, creating unfulfilled lives, physical problems with our wombs and cycles, problems with relationships, and a lack of purpose and direction in life. In the 1960s and 1970s the introduction of ‘The Pill’ freed us from the fear of unwanted pregnancies, but it also created in women’s minds the science-led approach of controlling and ‘fixing’ the body and the menstrual cycle. Rather than the freedom ‘The Pill’ promised women, it has alienated successive generations from their cycles and female energies until many women live in a culture where the effect of their womb and cycles is at best seen as irrelevant and at worst seen as negative. Science and medicine ‘solve’ the physical ‘problems’. Through subtle (and sometimes not so subtle) advertising, pharmaceutical companies teach women that the centre of female empowerment, the womb, is a problem that can only be fixed by suppression. The actual underlying problem – living in a society that forces us into an unnatural expression of femininity in order to survive – is not addressed, and so women’s physical, mental and emotional problems continue to develop and grow. We all embody disconnection from our womb to some degree because we have never had the freedom to grow up living totally female lives in a society that validates and nurtures authentic femininity. The Womb Blessings offer us hope and a new path, not just for ourselves but also for future generations. They offer us healing and release, and a way to return to feeling ‘good’ about our body and our self again. They provide us with what we ache for in our heart and in our womb – a way to feel authentic, connected and whole in our self. Connection is about experiencing a sense of self. Take a moment to notice where your sense of self lies within your body. The answer could be ‘in my head’, or if you are feeling loving at the moment, it could be ‘in my heart’. Now be aware of the palms of your hands. Do you feel them? Are they a part of you? Are they part of your sense of self? What about the soles of your feet? Can you feel them? Are they part of you? Now bring your awareness to your womb, or womb centre, that lies in your lower belly. Can you feel it? Does it feel part of your sense of self? For those of us who live ‘in our heads’ it can be very difficult for us to feel a sense of self in our womb unless we are experiencing pre-menstrual cramping or we are pregnant. This lack of awareness of our womb and the lack of a sense of self lying within our womb is the result of disconnection. You may have noticed that during this simple exercise your womb has started to respond to your attention. Perhaps you are starting to feel its presence, or perhaps it is cramping a little. Your womb is responding to your attention because it wants to re-establish the natural connection between mind and womb. Please select your delivery zone to ensure you are charged the correct postage.